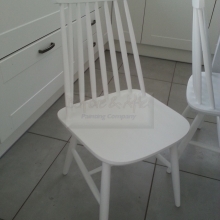 Hand Painting 30 year old Ercol Kitchen Chairs. 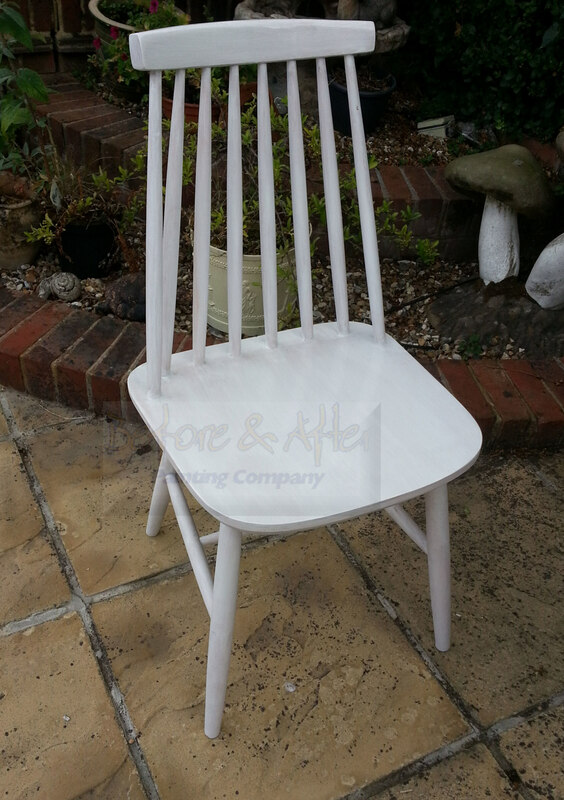 Before & After Painting were asked to hand paint a clients old Ercol chairs that were left to them by the previous owner. The old owner had bought them 30 years earlier. These chairs were very well built and sturdy, with no sign of major wear. The client had also purchased a new John Lewis table base and a new granite worktop to go on top after it had been painted. 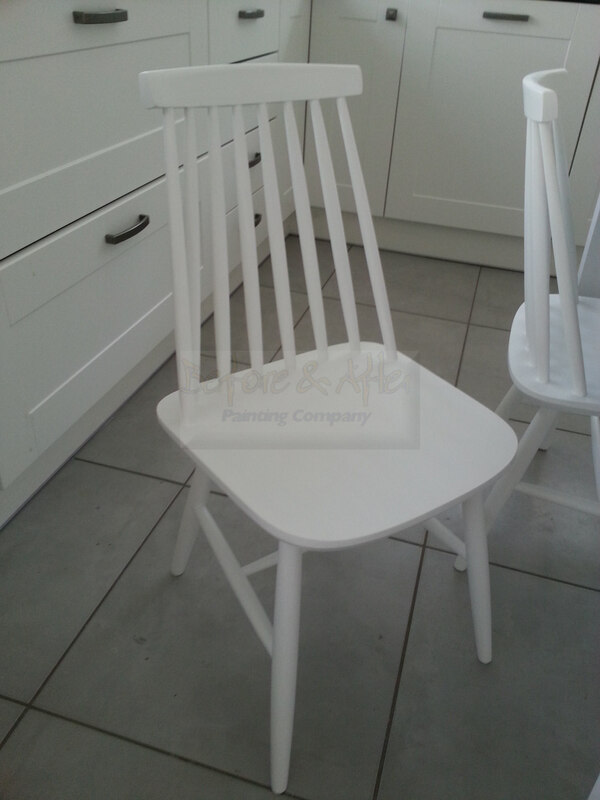 Preparing the Ercol kitchen chairs before painting. Most wooden chairs are not nice to sit on without some form of cushioning. These chairs were the same. The owner had stuck some Velcro on the seat of the chairs with an adhesive and stitched the other Velcro piece onto the cushion. In removing the velcro from the chair seat it left a sticky mess which needed cleaning. This was removed with methylated spirit and a cabinet scraper. 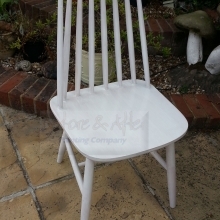 Now the chairs were ready for a good wash down with a 50:50 mix of Krud Kutter Original and water. This is a great cleaning and degreasing product from America and is available in the UK. 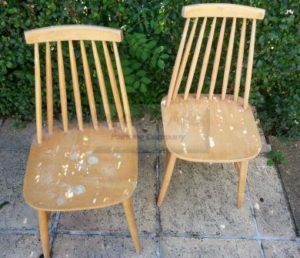 Once the chairs were dry, they got a further cleaning with Methylated Spirit all over. 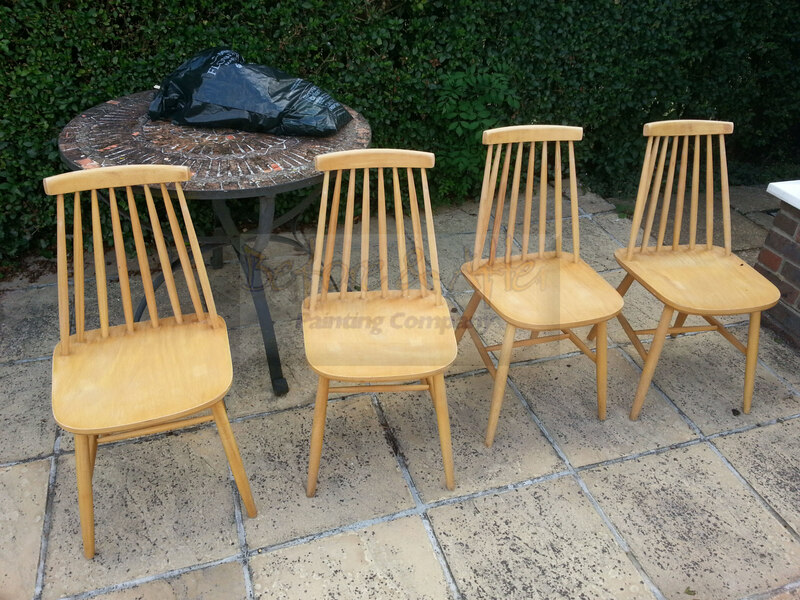 Then after the cleaning treatment, the chairs were sanded down using Abranet abrasives. Starting with 80 grade abrasive to remove existing varnish/lacquer. Dusted off, then abraded with grades of 180 Abranet abrasive down to 240. Once all chairs were abraded, they were vacuumed off using my Festool Midi Extraction unit. Then with a tack rag, all traces of fine particles were removed that the extractor didn’t catch. The primer of choice for this particular project was Zinsser Coverstain primer sealer as it is a great adhesion promoting paint. Something which is needed on a high use item of furniture. Two coats of Coverstain were applied, rubbing smooth between each coat, then vacuumed and once again, tack rags used between coats to grab any last few fine dust particles. Once the final coat of primer had thoroughly dried, it was time to think of breaking out the kit for applying the finish coats of paint. My choice of paint for this project was a water based eggshell supplied by Mylands of London. This is a lovely paint to use with the right type of brush for hand painted furniture. For the eggshell finish I applied three coats which made for a great finish as you will see within the picture gallery below. 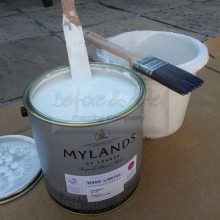 The Mylands water based eggshell is a good hard wearing choice of paint for furniture. However, as I say to clients when I am asked to hand paint their kitchens, please be gentle on the kitchens or furniture for around 30 days from completion. This is because paints do not reach their hardest point till then. It may be dry to the touch and feel robust, but it isn’t. So be careful for about a month. 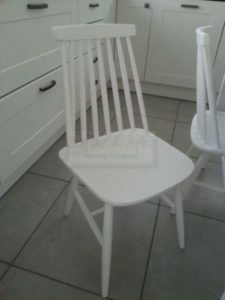 If you wish to try to paint your furniture yourself, don’t forget to make sure you carry out thorough preparation. 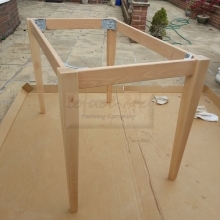 If you feel it could be a tougher project than you first thought, check out my gallery, then scroll past the gallery to my contact page and give me a call. 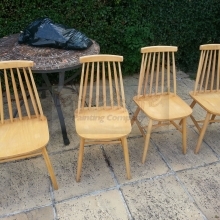 Chairs thoroughly cleaned down with Krud Kutter Original and methylated spirit. Sanded down and tack ragged. First coat of Zinsser Coverstain to wooden kitchen chair - Tunstall Kent. Zinsser Coverstain is a fantastic Adhesion Promoting Primer. 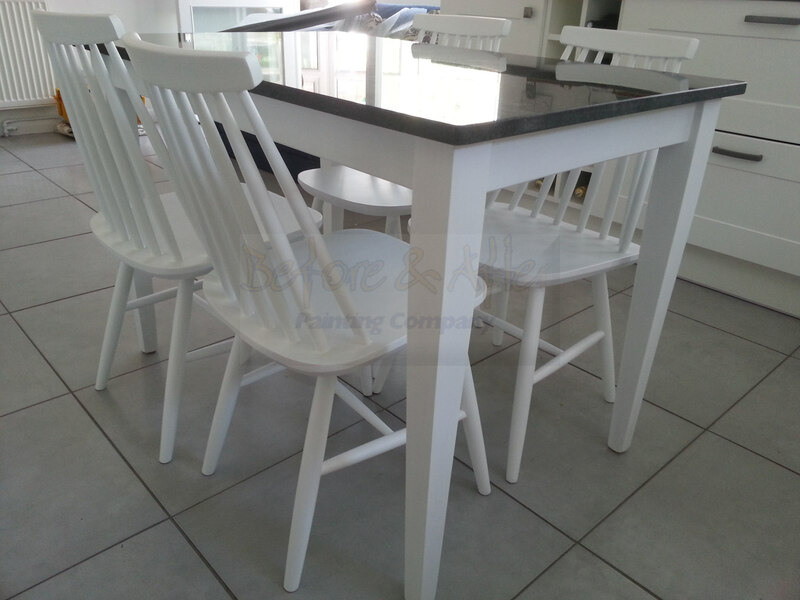 Hand painted kitchen furniture - painted with Mylands of London waterbased eggshell. 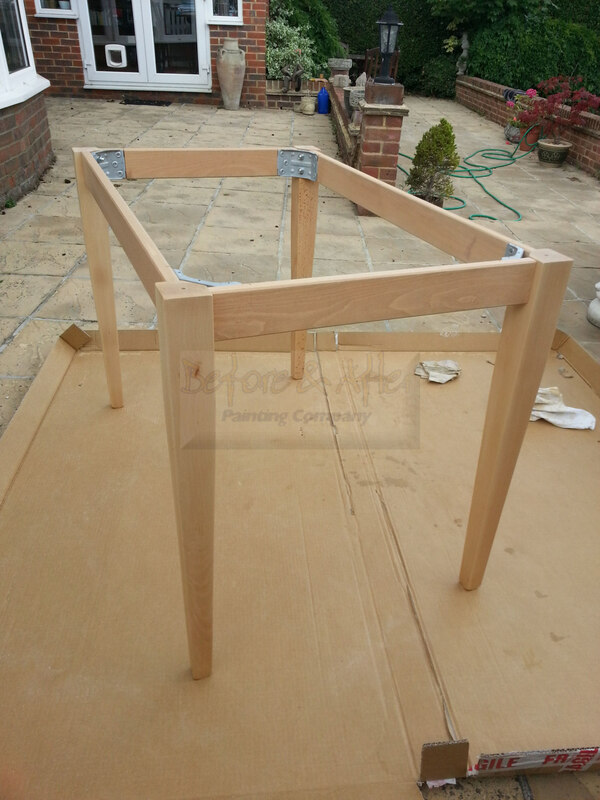 New table base from John Lewis which needs painting to match the kitchen chairs. 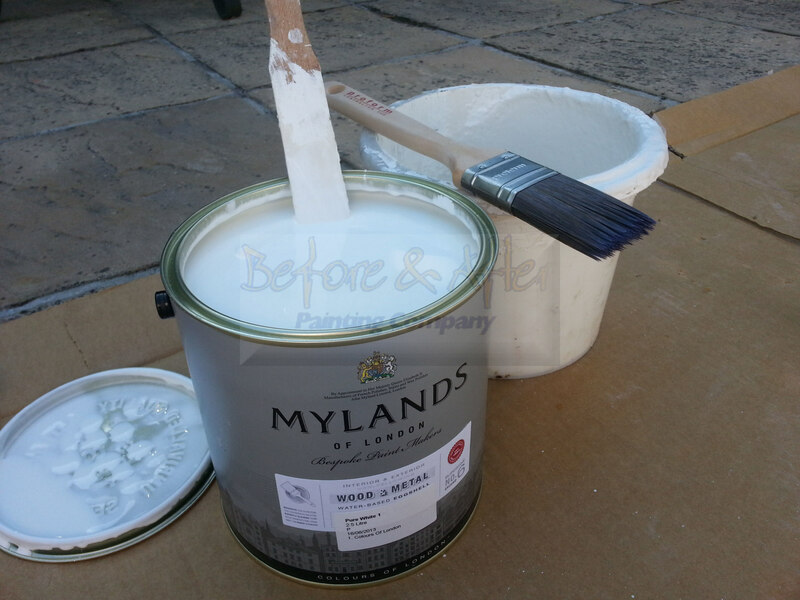 Mylands of London waterbased eggshell for wood and suitably primed metal. You'd never know this chairs was over 30 years old. 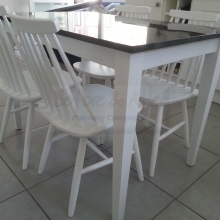 Looking for a professional painter to paint your furniture? If you don’t feel confident enough to carry out the task of hand painting the pieces yourself. Please do get in touch with me using the form below. « Mould problems should not be ignored.